Samsung created an amazing product that blends a 4k tv with a way to display art. It's flat mounted and comes preloaded with art that can be changed at the click of a button. We were tasked with documenting the work of two of the artists that contributed to the pre loaded art work that comes on The Frame. The brief called for local locations not far from home and we quickly realized that we could bring more to the project if we looked a little harder. David already had plans of going to Salt Lake City to continue working on his series of aerial photographs of the local salt flats and we decided to try and get the agency on board with the idea of letting us tag along for the ride. The dessert heat was a welcome change from our usual coastal climate and even hanging out the helicopter you could feel it radiating off of the salt as soon as we got within ten feet. Do to the small sized door openings in the R44 helicopter we had to shoot handheld with no stabilizer but it allowed us to get a but closer to Davids creative process in the long run. This was an action packed trip having only one day to shoot the whole thing. When not burning our hands on the rediculously hot black metal body of the Red camera we were backing up cards while bumping down back roads of the the salt flats. We had a great time meeting the challenges of this shoot head on. Callum has made quite a name for himself while documenting his journeys around the world and for this film we needed a location that would lend it self to the beautiful locations that he tends to shoot. With Callum's tight schedule we were challenged with finding something local that we could shout in one day. Did we mention that at this point in the summer most of Canada's west coast had been engulfed in a cloud of think smoke due to the large number of forest fires? We found an alpine location that with a bowl shape. The mountain's rocky faces and slopes would be close enough together that they wouldn't get lost in the thick smoke. Bugs ended up being the toughest thing to conquer on the day, they were picking, biting and stinging us all day with no remorse. 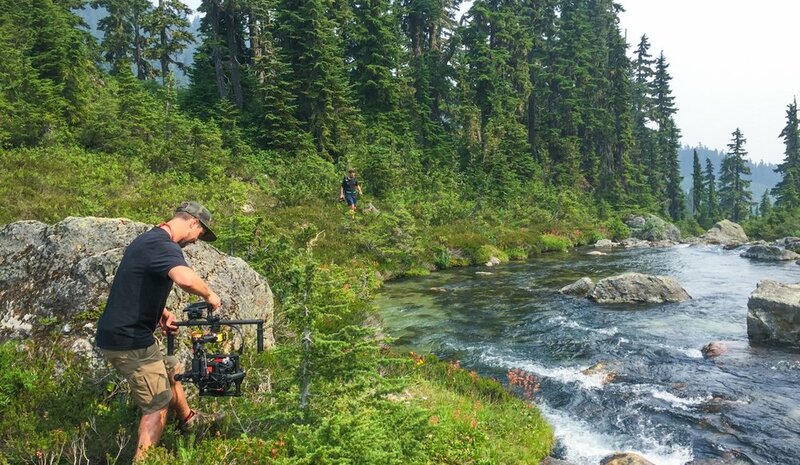 We hiked all of our gear in for this shoot including the Red Epic W, Movi gimbal, drone, tripod, two lights and light stands (used to create the night scene). Our biggest fear on the shoot was the smoke and as it turned out it added a really nice amount of atmospheric perspective during the day and at night.